The Forest Stewardship CouncilTM (FSCTM) has launched an ambitious new initiative to increase the use of materials from responsibly managed forests. The Forest Stewardship CouncilTM (FSCTM) has launched an ambitious new initiative to increase the use of materials from responsibly managed forests. The Vancouver Declaration allows businesses who use these natural products to pledge their commitment to responsible sourcing. The Vancouver Declaration is part of the FSC’s wider ambition to help businesses achieve the UN’s Sustainable Development Goals. 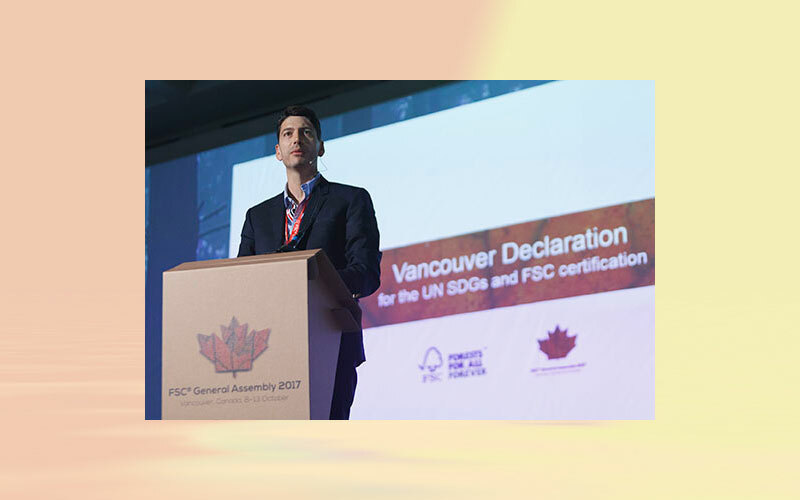 The declaration has now been presented at the FSC General Assembly 2017, which took place from 8 to 13 October in Vancouver, by Samuel Sigrist, SIG CFO designate. In addition to SIG, other well-known companies such as IKEA, H&M, Marks and Spencer, Carillion, Jysk, Mitsubishi Paper Mill or Fuji Xerox have already signed the Vancouver Declaration. For example, IKEA has committed itself to only use wood from more sustainable sources by 2020 and promote sustainable forest management beyond their own needs to make it an industry norm. The aim of the FSC is to bring companies on board across the entire supply chain.